Most high-purity water systems used in laboratories, sterilizers and manufacturing require frequent replacement of exchange tanks. However, EasyWater uses SmartGuard RO as a first step in purifying the water, which greatly lengthens the exchange tank lifespan. How is High Purity Water Produced? Much of the high-purity water, such as DI (deionized) water is produced through exchange tanks. 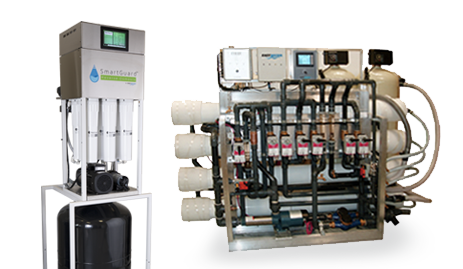 These anion, cation and mixed bed (both anion and cation) tanks remove the positively and negatively charged ions in water to produce different levels of water purity. The media in these tanks gets spent or used up and the tanks are then exchanged for tanks that have been regenerated. The ongoing cost for exchanging these tanks gets expensive, especially when you start with regular city water with a high mineral content. Why Choose EasyWater to Produce Your High Purity Water? At EasyWater, we use our SmartGuard RO system to remove most of the minerals or ions in water as the first step in making DI water. The SmartGuard RO water is then sent through one or more mixed-bed DI tanks to remove the remaining ions in the water. Sometimes the DI water is continually circulated through the DI tanks when higher quality (up to 18.2 megohm) water is required. Using SmartGuard RO as the first step in your DI process makes it simpler and less expensive to produce the high-quality DI water you need. Also, SmartGuard RO does not require softener or chemical pretreatment and does not take up a large footprint, making it a very practical and efficient first step in DI water production. Find out more about our treatment options for high purity water by contacting us today at 1-888-766-7258, or by filling out our free estimate form below.